At this year’s annual NAB Show in Las Vegas, there was a lot to be excited about in the world of live Internet broadcasting. Livestream, the live Internet broadcast platform, had quite a large footprint this year to show off their new wares. Livestream is best known for their live streaming service, but increasingly is becoming a full professional end-to-end broadcast solution. This mean the introduction of a bundle of new beautifully designed video switching and encoding hardware this year. Livestream has introduced new models of their Livestream Studio live production switcher. When Studio was introduced last year, the Studio HD500 was released as a portable PC-based plug-n-play switcher/encoder. This was followed by a software only version that anyone can run on their own off-the-shelf PC reference hardware with capture cards. For 2014, Livestream has expanded their lineup with the HD51, HD510 and the HD1710 Studio models. All models are multi-channel HD live production switchers that squarely take aim at Newtek’s Tricaster. The HD51 and HD510 can take up to five HD-SDI or HDMI sources, with the HD510 including a touch-screen monitor built in to its portable form factor. The HD51, and more expansive HD1710, require external monitors. The HD1710 can take in up to a whopping 17 HD-SDI video sources that all can be displayed across four multi-view monitors and switched live. All models allow for multiple channel ISO recording in AVI MJPEG format. Not the best if your workflow is editing in Final Cut Pro 7, but plenty fine if you’re using Adobe Premiere or Final Cut Pro X. A Livestream rep told me Quicktime format support will be forthcoming. The new awesome hardware doesn’t end there. Taking a cue from Apple’s industrial design department, Livestream has introduced a new hardware control surface simply called Surface. This control surface gives you an intuitive and customizable interface to all the controls of the Studio software interface. Every slider, knob and toggle of Surface is mapped directly to their software functions in Studio. Surface is actually composed of two modules, Core and Track. Core is the main switching control surface that works with up to 5 source channels. Track is the add-on module that gives you 15 more source channels to control, something you’ll want if you have a Studio HD1710. 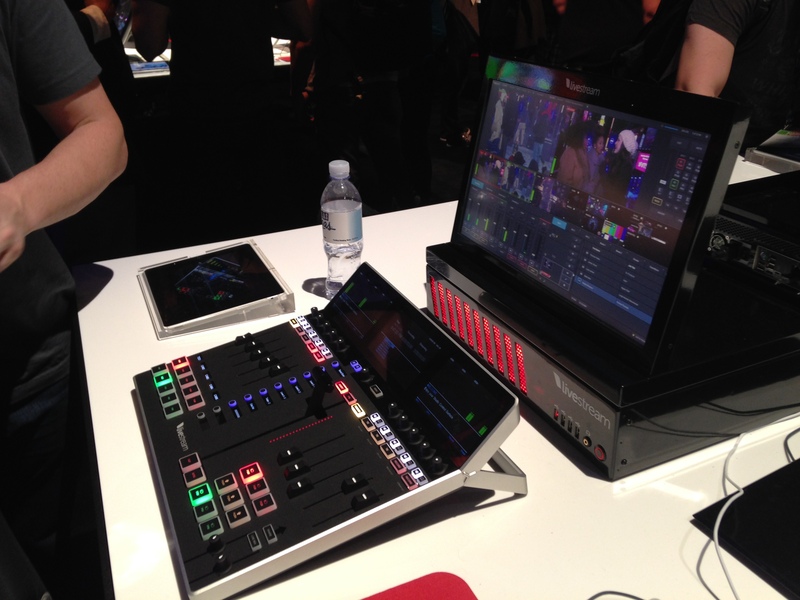 Livestream Studio combined with Surface looks to be a formidable competitor to Newtek’s Tricaster line. Features such as multiple program outputs, graphic overlays and titles, downstream keying are all native to Studio. One thing I’d like to see better support for is expanded audio input connections. Livestream’s switchers have one or two 1/8″ mini jacks for audio, otherwise audio is expected to come in embedded over the HDMI and HD-SDI inputs. The specs on the HD500 and HD1710 do claim they can take up to four 1/4″ RTS analog audio inputs, though it looks like you’ll need to have a nest of breakout cable snakes to pull this off as these models use Blackmagic Design’s DeckLink Studio capture card for this. Tricaster does have the advantage here in that XLR and TRS analog audio input connections are natively hardware mounted across their line. Another standout feature for Studio is the ability to mix in a variety of remote camera sources. Smartphones running the Livestream app, Teradek and Broadcaster wireless camera-top encoders and even Google Glass are all supported live sources. As an encoder, Livestream Studio supports all major streaming platforms and RTMP destinations. YouTube and Ustream profiles are populated in the destinations menu. Though Livestream does include a year of their broadcast Platform service with their hardware, using it is by no means required. I’ve written about Livestream’s service offerings previously. All told, Livestream is firmly carving out a beautifully designed, intuitive, end-to-end live broadcast ecosystem. We’ll be keeping our eyes on them as they grow.